We have two new editions for your feet. The Unisex Fibra Sandals and the unisex Kin Accessories. First, a casual pair of rigged-mesh sandal that includes 2 versions – Flat & Platform. This sandal is a Slink Add-on for both Female & Male flat mesh feet (AvEnhance). Which means this sandal can only be worn with the Slink flat feet (AvEnhance). Therefore, you have the choice of either purchasing Singles or Sets. ▪ The “Flat & Platform” version is only available for female. ▪ Cannot be resized nor repositioned. In addition, the unisex KIN Accessory set. KIN represents Kinship, family and unity. This is a tribal inspired full set of accessories handcrafted with intricate details on every piece to perfection. 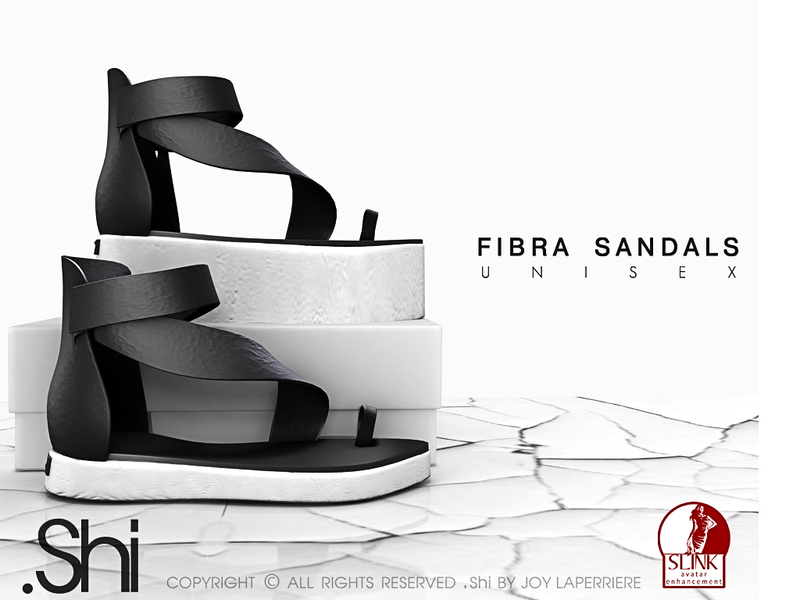 KIN is also made compatible with Fibra Sandals. This accessory is a Slink Add-on for both Female & Male flat mesh feet (AVEnhance). *Rigged items cannot be resized nor repositioned.